To direct sow your seeds just means to plant your seeds outdoors in the garden where it will grow instead of starting the seeds indoors in containers under lights. If you live in a warm climate, you can direct sow almost any crop. Those of us who garden in colder areas either begin sowing seeds indoors under lights or purchase seedlings from a green house that can be transplanted into the garden after all danger of frost is past. If we don’t start some crops ahead of time, there isn’t enough time to produce a harvest before our first fall frost. Not all plants need to be started early under lights even for those of us in colder areas. Plants that are either difficult to transplant or don’t need extra time to get a jump start can be sowed directly into the ground. Block Method: Vegetable seeds are planted in grid patterns spaced evenly in all directions. The planting method is commonly used in square foot gardening, raised bed, or intensive gardening. 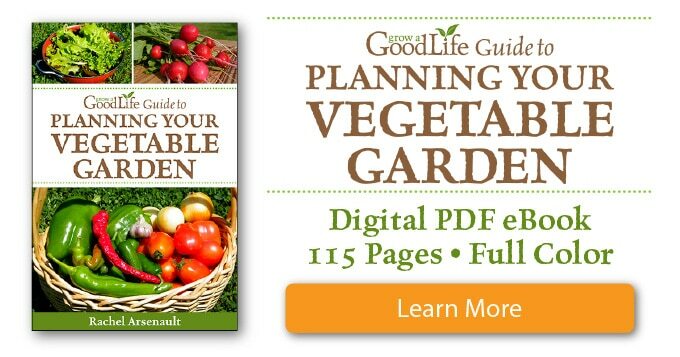 When using the square foot gardening method, you plant each square according to the plant spacing described in the book. Or you can space your seeds according to the instructions on the seed package. Simply poke holes in the soil, drop in your seed, cover, and water. Mounds or Hills: Piling the soil into a small hill creates a raised planting environment that will drain well and heat up quickly, much like a raised bed. Warm soil can help seeds germinate quicker. Some vegetables like squash and cucumbers like to spread out. Growing in mounds in the center of the garden bed provides plenty of room for the vines to stretch out. Pull up the soil into a mound of about 6-inches (15 cm) high and 1 or 2 feet (30-60 cm) in diameter depending on the crop. Flatten out the top and plant your seeds according to the seed package instructions for depth and spacing. Water and keep soil damp until the seeds sprout. Furrows or Rows: Following the seed package instructions for depth, dig a shallow trench through the soil. Sprinkle your seeds along the length of the trench according to the spacing recommendations on the seed package then cover the seeds with soil. Water gently and keep the soil evenly moist. Review the Seed Packet: The back of the seed package has information on how to sow your seeds for the best results. It tells you the best time to sow the seeds, how deep to sow the seeds, how far to space them out, and how to thin out the seedlings once the seeds have sprouted. The time to start your seeds will depend on your last frost date. This is the average date of the last expected frost date for your area. You can find your last frost date by contacting your local extension office or enter your zip code here at PlantMaps.com. Prepare your Beds: Before sowing your seeds, prepare your garden beds by removing all the weeds and adding some compost and fertilizer. Remove any large clumps and rocks. If the weather has been dry, prepare and water the bed very well the day before you sow. 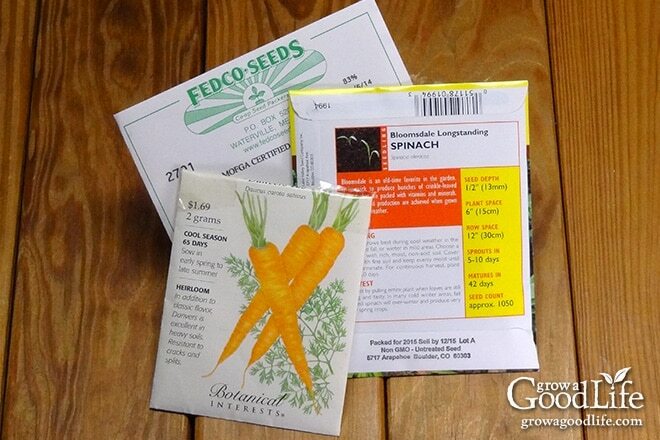 Sow Your Seeds: Select a sowing method and plant your seeds according to the directions on the seed package. Once the seeds are planted, firm the soil gently to ensure good contact between seed and soil. Mark your planting location with plant stakes so you don’t forget what you planted. Water in and keep the soil evenly moist until the seeds sprout. Don’t allow the soil to become waterlogged or the seeds will rot. Once the seedlings become established, let the soil dry slightly between waterings. Thin Your Seedlings: Often times the seed package will have you plant more seeds in the ground in case some don’t sprout. Some seeds, like Beets and Swiss chard will sprout multiple plants from one seed. Your seed package will recommend you thin your plants down after the true leaves appear so the plants have more room to grow. The easiest way to thin is to use a pair of scissors. Choose the healthiest and strongest plants to survive, and cut the unwanted plants at the soil line. That way, you won’t disturb the roots of the remaining plants. Mulch to Hold in Soil Moisture: Once the seedlings become established, mulch the beds to help hold in soil moisture and suppress weeds. Keep mulch a few inches away from the stems of your seedlings so it doesn’t smother the plants. 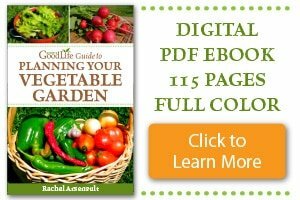 Learn more about How to Use Mulch in Your Vegetable Garden. There are generally two types of beans, bush and pole. 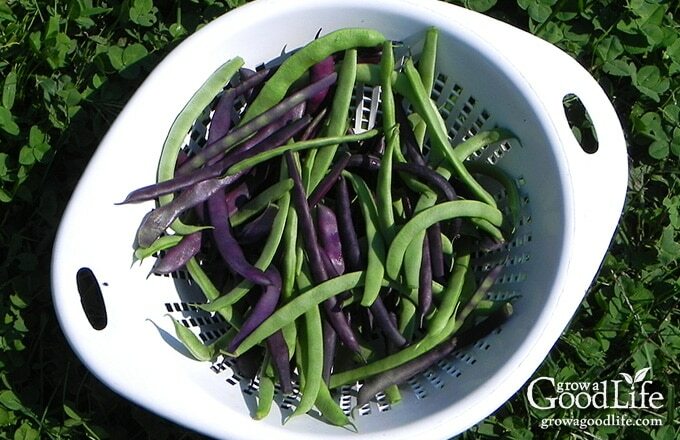 Pole beans grow long vines and will need support of a pole or trellis. Pole beans continue to produce for a long time until frost. Bush beans produce their crop quicker and all around the same time. Plant several succession plantings of bush beans two weeks apart for a continuous harvest all summer long. Seeds germinate quickly in warm soil and can benefit from a brief soaking in water for 4-6 hours before planting. Sow in late spring when the soil warms after danger of frost is past. For most varieties, plant 1-inch deep, 3-4 inches apart. Thinning is not usually necessary. This double-duty crop produces both fresh greens and roots. Beets prefer cool weather. Direct sow seeds as soon as the ground can be worked. 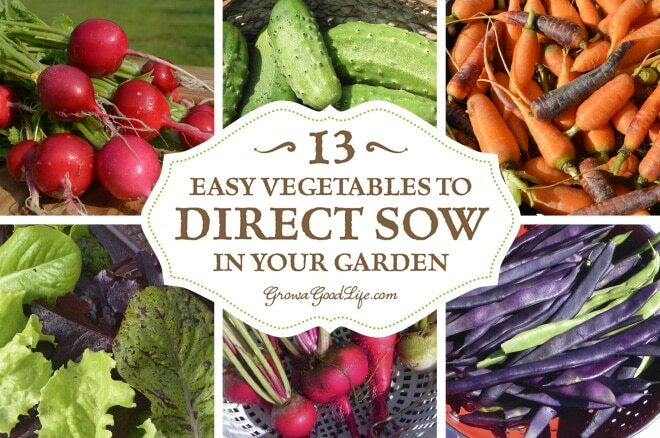 Sow every three weeks during the cooler months for a continuous harvest. Seeds germinate quicker in warmer soil and can benefit from a brief soaking in water for 4-6 hours before planting. For most varieties, plant seeds 1/4 inch deep and 1 inch apart. Beet seeds are actually a seedpod that contains several seeds. Once the beets are about 5-inches high, thin to one plant every 3-6 inches. You can eat the thinning. Carrot seeds are small and difficult to space individually. Homemade Seed Mats make sowing carrot seeds easy. Carrots are a cool-season crop and will tolerate frost once established. Direct sow seeds about three weeks before the last expected frost. Sow seeds 1/2-inch deep and 1/3 inch apart. Keep soil evenly moist. Once seedlings are 2-inches high, thin to one plant every inch for baby carrots, or one plant every 3-inches for larger carrots. Since corn is wind-pollinated, it should be planted in blocks or at least four short rows side-by-side resulting in a block of plants. Direct sow seed outdoors when the soil temperature is about 60˚ F about two weeks after last frost. For most varieties, plant 1-inch deep, 4-6 inches apart. Thin to one plant every 12 inches. 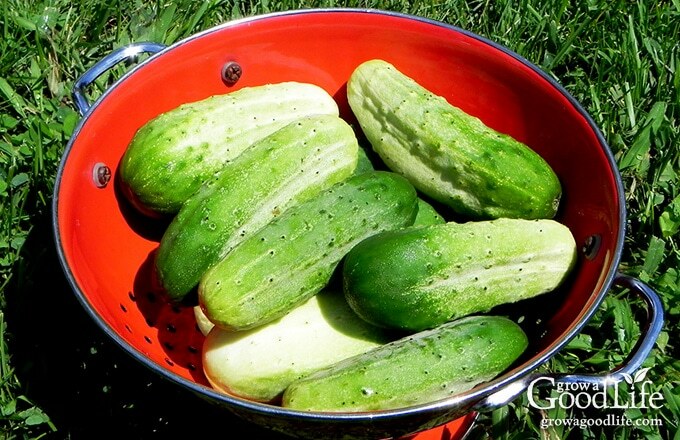 Grow cucumbers in mounds and allow plenty of room for the vines to stretch out or grow along a trellis to save space. Direct sow seeds when the soil has warmed, about a week after your last frost date. For most varieties, plant 1-inch deep, and 6-8 inches apart. If you are growing cucumber on mounds, sow three plants per hill, and space your hills 18 to 36 inches apart. No thinning is needed if you are growing along a trellis or in mounds. There are so many varieties of lettuce with various colored and shaped leaves. Lettuce prefers cool weather and will tolerate frost once established. Direct sow seeds as soon as the ground can be worked. Plant seeds 1/4-inch deep and keep soil evenly moist. Thin leaf lettuce varieties to 4-inches apart, cos and loose-head varieties to 8-inches apart, and firm head varieties to 16-inches apart. Homemade Seed Mats make sowing lettuce seeds easy. Some pea varieties grow short vines and some long vines, but all pea plants benefit from some trellis supports to satisfy their climbing nature. The pods will be easier to harvest along a trellis too. Peas like cool weather and will tolerate some frost once the plants are established. Seeds germinate quicker in warm soil and can benefit from a brief soaking in water for 4-6 hours before planting. Direct sow pea seeds in early spring as soon as the soil can be worked. For most varieties, plant 1-inch deep, 2-3 inches apart. Thinning is not usually necessary. 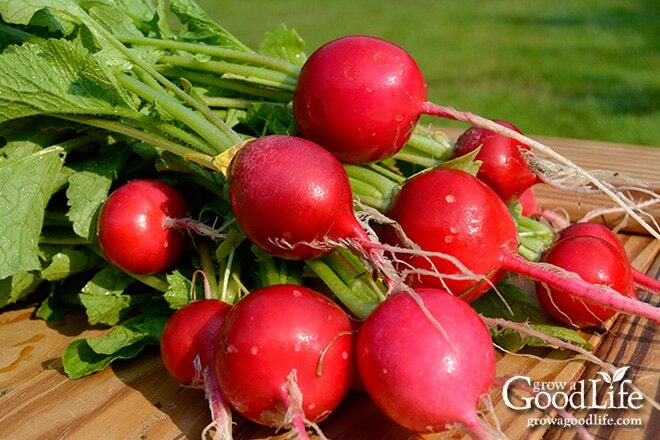 Radishes are a rewarding vegetable to grow. It prefers cool weather and matures quickly. 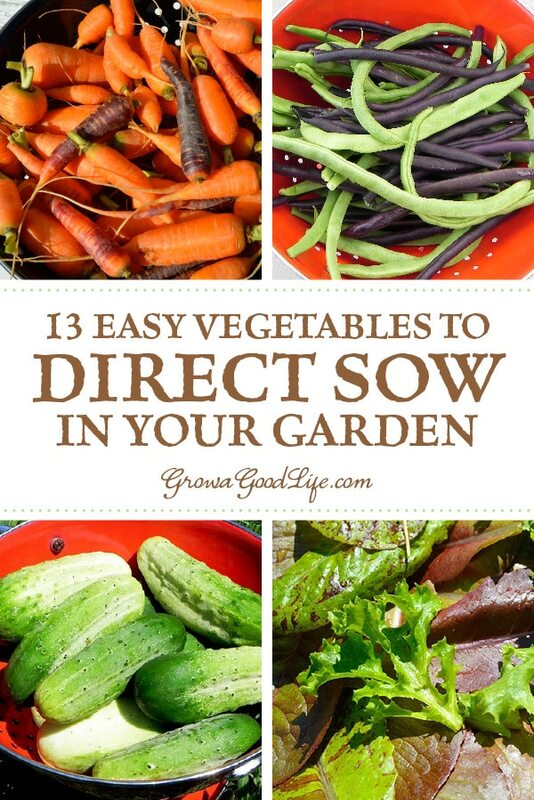 Sow every two weeks during the cooler months for a continuous harvest. Direct sow seeds as soon as the ground can be worked. For most varieties, plant 1/2-inches deep, 2-3 inches apart. Thinning is not usually necessary. Scallions (also referred to as bunching onions) are frost tolerant and many varieties will overwinter and continue growing the following season even in my Maine garden. Direct sow seeds as soon as the ground can be worked. Plant seed 1/4 inch deep, 1/2 inch apart. Thin to 2-inch spacing for smaller bulbs but higher yields, or 1-inch spacing for scallions. Spinach prefers cool weather and even young plants will tolerate frost. Sow every two weeks during the cooler months for a continuous harvest. Sow again in mid- to late summer for fall harvest. Seeds do not germinate well in warm soil. Pre-sprouting seeds increases the germination rate. Direct sow seeds as soon as the ground can be worked. For most varieties, plant seeds 1/2 inch deep, and 1-inch apart. Thin to 2-6 inch spacing. 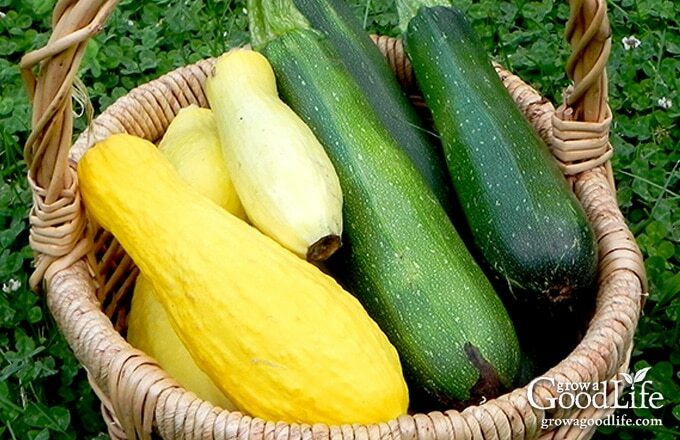 There are two main types of squash, winter squash and summer squash. The difference is their harvest time. Summer squash is harvested young, while the skin is soft. Winter squash takes much longer to ripen and are harvested when fully mature. Direct sow seeds when the soil has warmed, about a week after your last frost date. Use the mounds method for most squash varieties. Plant 1-inch deep, and 6-8 inches apart. Space your hills 4-6 feet apart depending on the size of the fruit. Thin down to three plants per hill. Swiss chard is one of the few greens that will grow in both cool weather and heat. Direct sow seeds two weeks before your last frost date. Seeds germinate quicker in warmer soil and can benefit from a brief soaking in water for 4-6 hours before planting. Plant seeds 1/2-inch deep and 2 inches apart. Like beets, Swiss chard seed pods contain a number of seeds Once the beets are about 4-inches high, thin to one plant every 6-12 inches. Grow turnips for both the greens and roots. It prefers cool weather. Sow every two weeks during the cooler months for a continuous harvest. Direct sow seeds as soon as the ground can be worked. For most varieties, plant 1/4-inch deep, 1-2 inches apart. Once seedlings are 4-inches high, thin small turnip varieties 2-4 inches apart and larger varieties to 4-6 inches apart. Thinning is not necessary for greens. Was your favorite direct sow crop on the list? If not, leave a comment and let us know what you think are easy vegetables to direct sow. This article was originally published on February 19, 2016. It has been updated with additional information, photos, and video. Having all these veggies gathered in one place comes in very handy. Cucumbers and corn are personally my favourite! Spring is in the air and it’s time to plan our gardens. I am so delighted that you shared your healthy and delicious these vegetables that we can direct sow at the Healthy Happy Green Natural Party! I’m Pinning and sharing this! Good morning! Just a little note to let you know that this article has been FEATURED today on the Art of Home-Making Mondays at Strangers & Pilgrims on Earth! Thank you for joining us and have a wonderful week! I would love to be able to direct sow. Unfortunately being impatient and in Canada, I usually germinate indoors. It isn’t often I wish an article had a print button… this one qualifies! I sometimes don’t have the best of luck with direct sowing and will often grow transplants for things such as lettuce and chard. But it’s good to have options – last year my indoor seeded fall lettuce was a complete failure. I would not have had any to harvest had I not direct sown subsequently – I still had issues, but at least I ended up with a modest stand of lettuce at the end. I do both too. I like to start lettuce and chard indoors to give them a head start. After transplanting these to the garden, I usually direct sow some seeds for a succession crop. The direct sowed plants usually catch up quickly.